The remains of two U.S. Air Force servicemen killed in action during the Vietnam War have been identified and are being returned home to their families. They are Master Sergeant Thomas E. Heideman and Captain Craig B. Schiele, both of Chicago. On October 24, 1970, Heideman and Schiele were crewmembers of a CH-3E helicopter as the lead of a two-ship formation on a mission to extract friendly forces from Laos. Shortly after takeoff, the helicopter crashed into nearby dense jungle. Eight Laotians and two American servicemen were rescued. A rescue mission was continued the next morning, but there was no evidence of survivors. The only body recovered from the crash site at that time was later identified as the pilot, Captain Schiele, who was subsequently buried in Bartlesville, Oklahoma. artifacts but no human remains. and other physical evidence such as personal artifacts and the human remains, the forensic scientists at CILHI identified the remains as those of Schiele and Heideman. A group burial with full military honors for these two servicemen will be conducted June 7, 2002, at Arlington National Cemetery. The remains of two Chicago-area airmen killed in a risky Laotian mission during the Vietnam War have been identified and will be buried this week at Arlington National Cemetery, the Pentagon said Monday. 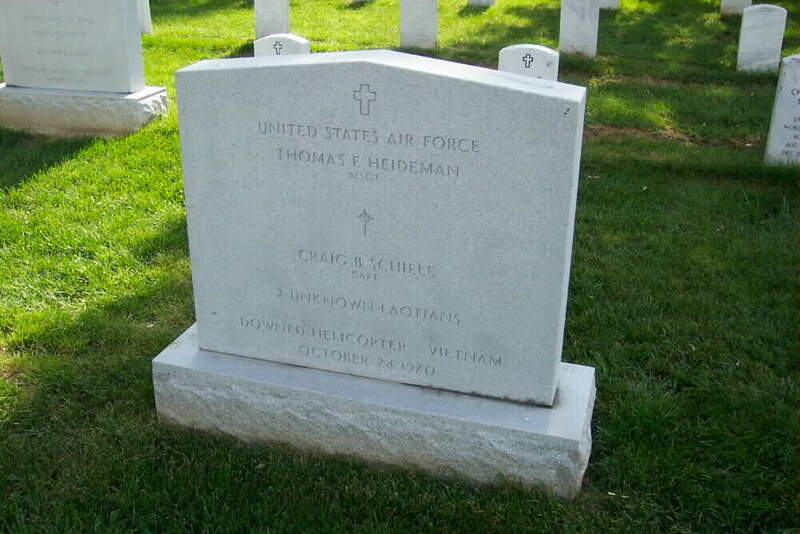 Air Force Master Sergeant Thomas E. Heideman and Captain Craig B. Schiele were killed October 24, 1970, while serving as crew members of a CH-3E "Black Maria" helicopter sent to rescue friendly forces from Laotian territory. Piloted by Schiele, their helicopter was the lead ship of a two-aircraft contingent carrying out the rescue at a time when large-scale North Vietnamese forces were operating in Laos. retrieving Schiele and Heideman could not be mounted until the following morning. who was 27 at the time of his death, was buried in the family plot of his wife, Margery, in her hometown of Bartlesville. Schiele was a 1966 graduate of the Massachusetts Institute of Technology and a native of west suburban Lombard, his sister said Monday. The Schiele family moved from Illinois to Steubenville, Ohio, after Schiele had completed his second year of high school at Glenbard High School. Because Schiele received a draft number indicating he would likely have to serve in the armed forces, he enlisted in the Air Force after college graduation "to choose his own course" and was first in his officer candidate class, his sister said. His wife had been living in Oklahoma at the time of his death, Lynne Schiele said. At the time of the rescue effort that uncovered Schiele's remains, there was no sign of Heideman, then 37. His mother, Olivette, lived at 1617 W. 83rd St. in Chicago. In 1971, he was posthumously awarded the Distinguished Flying Cross, the Air Medal and the Commendation Medal, which were accepted by his wife, Patricia, in ceremonies at Shaw Air Force Base, South Carolina. Though the U.S. had been conducting widespread covert operations for some time in Laos, it was not until November 1970 that it became a significant battleground of the war, with large South Vietnamese army units moving in against communist elements there. U.S. ground troops had been banned from use in Laos, and most of the fighting there was conducted by friendly Laotian and South Vietnamese forces. With the cooperation of Southeast Asian governments, the U.S. in the 1990s began an effort to locate and identify the remains of U.S. troops reported missing during the war. On December 14, 1994, a joint U.S.-Laotian recovery team visited the crash site in Laos' Khammouan province, and recovered helicopter debris and some personal artifacts but no human remains. The next spring, a second recovery team searched the area and excavated the ground, this time discovering human remains as well as additional personal artifacts. These were taken to the U.S. Army Central Identification Laboratory in Hawaii. 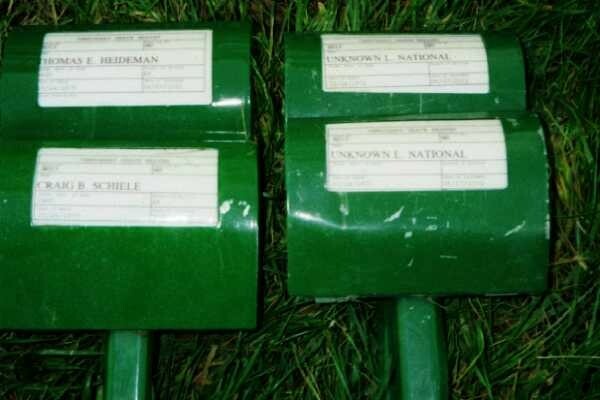 After a long, painstaking investigation by forensic experts involving scientific analysis of the human tissue, as well as examination of the personal effects and eyewitness accounts of the incident, the Pentagon said the remains belonged to Heideman and Schiele. Lynne Schiele said a report she received following the identifications stated that though DNA testing was done on the remains, they could not be positively identified as a specific person. Two Laotian soldiers also died in the crash. "My understanding from the report that I received was that none of the remains could be identified with any one of the four people who died," Lynne Schiele said. "The only reason the site was excavated was to determine the status of Master Sergeant Heideman. It could not be positively identified, which is why it's a group burial." Heideman's remains and Schiele's partial remains will be buried Friday at Arlington in a group service with full military honors. Despite lingering questions about the exact nature of the accident that killed her brother, Lynne Schiele said she and some of her cousins will attend the ceremony.